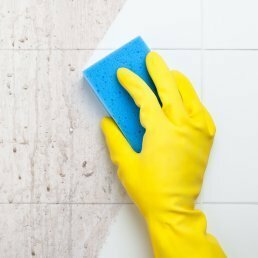 Whether you have a tile shower, counter or floor you can quickly and easily clean your tile and grout by making your own cleaner. This guide contains homemade tile and grout cleaner recipes. To clean icky grout, pour hydrogen peroxide on grout, and watch it bubble. After about ten minutes all the gunk will be loosened and will wipe away. And you don't have to be exposed to fumes or irritating and highly toxic chemicals. You can also use vinegar and baking soda, but this is easier. I have used several cleaners to clean my walls in the office, which still had wallpaper paste drips staining the painted surface below the paper border. It's easy to spot the drips when the light hits the walls surface. Regular cleaners that run down the surface make a mess. And since the cleaner hasn't had time to do its job, I've got to use a lot more elbow grease to get it clean. The secret I have discovered for upright surfaces. Cleaning is easier with a foaming tub and tile cleaner like Dow Foaming Bubbles. It adheres to the surface giving the cleaner time to break down the grease or dirt. I also use it to clean under the hood of the stove, refrigerator walls, oven door, ice chest, etc. try it and you'll do a lot less scrubbing. Here are two cleaners that you can make yourself and use to clean your tiles and grout. Mix the the chlorine bleach and water in the spray bottle. Then spray it on the grout and wipe off with a sponge. If the grout is especially dirty you may need to spray liberally and let it sit for about 10 minutes and you may even need to break out an old tooth brush if it still doesn't come off easily. Tip: If you clean your tiles regularly with the Tile Cleaner solution you won't have to use the Tile Grout Cleaner solution very often. When you are cleaning tile, use a bit of Coke on the stains. The ingredients in Coke will remove the stains. I have always used baking soda and peroxide in the spray bottle with some warm water and a scrub brush and it works wonders! Spray it and scrub it. It gets the grout very clean, the white will be very very white. Two years ago we installed a fiber glass tub/shower combo with 12x12 tiles surrounding the tub. A small amount of mold is beginning to form where the tub meets the tile grout. Can I use a small amount of bleach on the tile grout to get rid of the mold? Will the bleach hurt the tube in any manner? Using bleach will actually (surprisingly) worsen your mold problem. You should use something like lysol or any other kitchen cleaner that doesn't include bleach. Try leaving your shower curtain open to increase ventilation, hence decreasing your mold problem. This will kill and remove the mould dissolve half a cup of borax in 2 cups warm water of water and add half a cup of white vinegar,Put into a spray bottle,leave it soak for a few minutes use a stiff brush and wipe clean.If the mould is old this will need to be repeated. I use a clorx bleach pen on grout. As long as the grout isn't one of the special "colored" ones, it's fine. However, do you really have grout meeting the edge of the tub? There should be calking around around the tub, not grout. Calk is more resistant to mold/mildue and all around a better choice for a transition between the tub and tile. I don't understand how straight or diluted bleach can worsen mold in the bathroom. I would never think of using anything but bleach in my bathroom, the #1 area for the growth of staph. That's correct. And if the caulking is peeling off you need it removed and re-caulked. What should I be using to clean the ceramic tile in my shower? I have tried store bought cleaners, but they leave a white film. I know that certain cleaners are not good for the grout between the tiles. I have tile in one of my bathroom showers and I use a homemade organic cleaner. I purchased a spray bottle from the dollar store, when you are ready to clean the shower, pour about a 1/4 cup of vinegar, and a 1/3 cup of Borox into the bottle, then fill the bottle with HOT water. Shake up, spray on titles, clean then rinse. It won't harm the grout, you or the environment. I've always used The Works, but last time I cleaned the walls, I used Barkeepers Friend and it worked great! Left no residue after being rinsed off. Borax is natural and organic, perhaps, but not harmless. Read the directions and warnings on the box before you choose to use it. I use it for laundry, but you must be aware that it is not a food substance like vinegar. There is very little that will harm tile - that is the beauty of it. I wipe down the walls after every shower (or after the last person showers in the morning), and I seldom need to clean. That white film sounds like it is a hard water film, in which case, straight vinegar will remove it.